Glittering glasses under the blinding rays of the sun in summer, strips of paper fluttering gently along the breeze, a loud and crisp tinkling sound that seems to beckon a gust of refreshing wind… Wind chimes often remind us of summer. A wind chime is a wonderful existence since its refreshing shape and sound bring coolness for not only our sense of sight but also our sense of hearing. When wind chimes and their refreshing qualities get paired up with the girls of summer, we will find in them plenty of comforts to relieve some of the intense heat of summer. 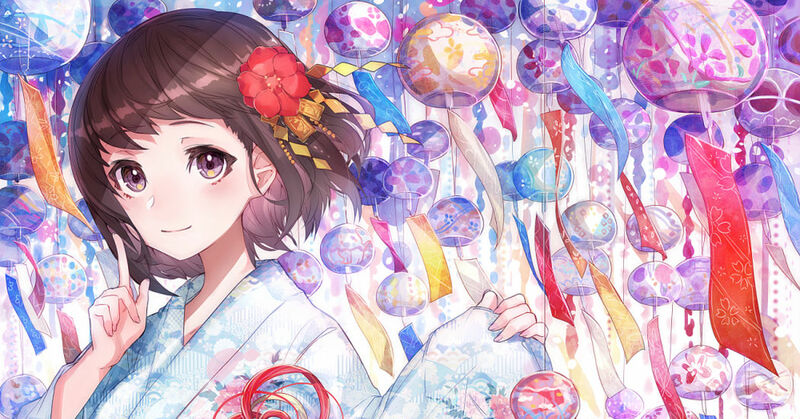 This time we’re featuring illustrations of wind chimes and girls. Enjoy!